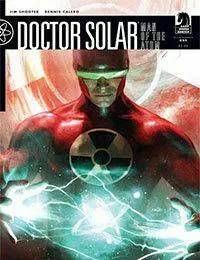 Empowered by a thermonuclear catastrophe, Doctor Solar discovers that he can control energy. Immeasurable strength is his at a whim. Power beyond imagination courses through his body. But he knows that the same kind of science run amok that created him can also empower the wicked. In the aftershock of the cataclysm that created Doctor Solar, ripples throughout space time imbue one Whitmore Pickerel with the power to create life -- which he uses to serve his selfish desires and reckless ambitions. His newly created being, Leviathan, invulnerable and immeasurably strong, clashes with the Man of the Atom in a fierce battle that ravages the city. Meanwhile, for his personal amusement, Pickerel creates Glow, a living fantasy of unearthly charms... and deadly possibilities!